Skin doctors have warned of the dangers of sunbed use, saying nearly 20% of those who use tanning beds could be addicted. Researchers in Germany and the US quizzed users and non-users on their feelings about tanning in a bid to identify addictive behaviours. People were asked whether they craved or urged going on the sunbed, among other queries. 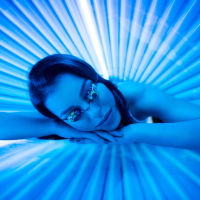 The researchers identified symptoms of indoor tanning addiction among 19.7% of the 330 sunbed users they surveyed in Germany. Nina Goad, of the British Association of Dermatologists, said: "This is an interesting pilot study with two important developments: the first is a new way of measuring symptoms of tanning addiction in a large population group. "The second is the finding, on testing this method, that as many as one in five sunbed users may have symptoms of addiction." Nina Goad said there was "strong evidence" that sunbeds increase the risk of skin cancers. She said this increased risk included the most deadly type of skin cancer, malignant melanoma. "For people who start using sunbeds before the age of 35 years, the relative risk of malignant melanoma almost doubles. "If indoor tanning does indeed have addiction potential, being able to assess the scale of the problem will be imperative. "It certainly would help to explain why so many people continue to use sunbeds despite knowing the risks." Skin cancer survivors can arrange specialist medical travel insurance when taking a holiday.